if you are playing football this fall. 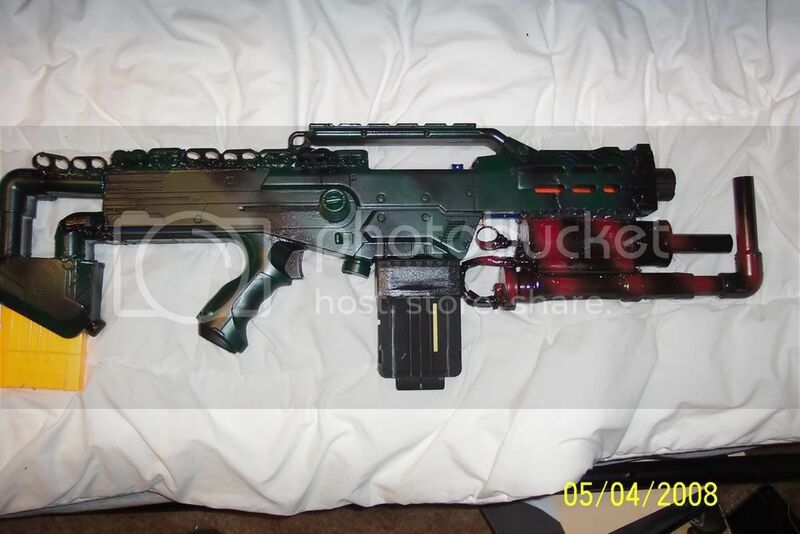 Draw out your gun, color in different styles, select the one you want, tape accordingly, buy your paint, paint, then take off the tape after drying, then clear coat. Its not that hard. Here is my longshot in its two forms that it took on before a third revamp and rip up. Edited by BustaNinja, 14 August 2008 - 10:34 PM. 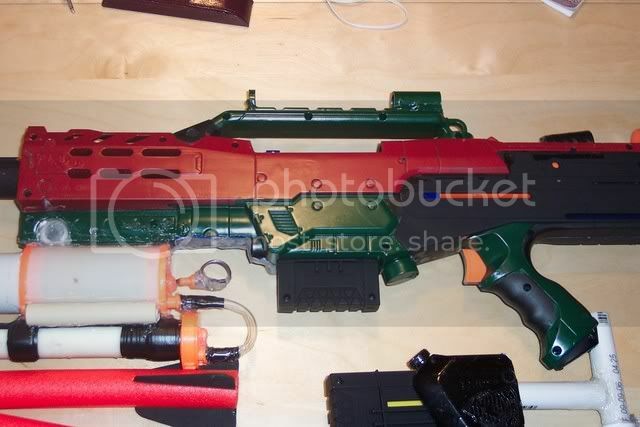 A really common technique that people do is paint the gun one color, put masking tape on the part you want the original color to be on, then put another coat on over the masking tape, and remove it. Another common thing to do is steampunk, but that can be kind of hard. Edited by UpperHand, 14 August 2008 - 10:28 PM. The least you could do is tell me some advice. geese! Church... gotta soak up that Jesus! Then paint it black with accents of silver. But make sure at least the black is matte finish, or it won't look at all realistic. Edited by bartel, 14 August 2008 - 11:07 PM. Keep in mind if it is too realistic you need to have an orange tip. There is a sticky for modifications and pictures. Go there. Go there now!!! Like most people that don't bother simply looking thru the mod/paint job thread to see the vast assortment of LS's that have been painted various wonderful colors and styles, I must suggest that you paint your Longshot and any other gun that you ask for suggestions on what colors to paint, the color pink. Pink with lavender accenting. Forgive my spelling and grammar. I post from my cell phone a lot. Sometimes when I'm on the can at work. Something that stands out would be cool like the post above me, but seriously. It's super easy to just go into the Modification thread. I looked throught all 97 pages at one time and it took like 15 minutes. I probably will go throught it again. 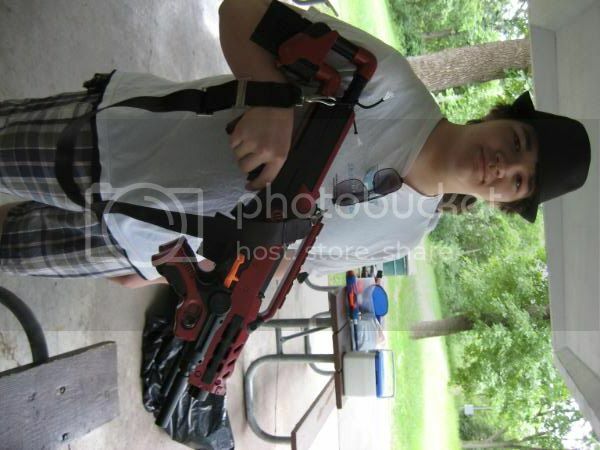 TONS of nice guns in there. Many people spend half their day here, I think. 15 minutes to peruse the mod pics and paintjobs wouldn't kill you. Or pay DirectThreat your left nut, and get something awe-inspiring. Or even Baghead (I like his paintjobs). Is it that hard to draw? Are people seriously that art-dysfunctional that they cannot pick up a pencil and some felts and put them to paper? Is color theory really that difficult? Heck, is it even that difficult to just look around and take inspiration from other things, and steal the color palette from another object? And whatever happened to themed paint jobs anyways? What happened to copying the color scheme of a bee (black and yellow), or Optimus Prime (silver,l red and blue)? I try to follow a Panda theme myself. Find something to copy! Nerf United Vancouver|(June 25) Return to Elevator Action!